Has the dollar really lost its supreme place in the world? Listen in as host, Jason Hartman, discusses this subject with long time foreign exchange expert, Marc Chandler. In this episode, Chandler explains why so many are wrongly defining current conditions of both the dollar and the U.S. economy. Chandler joins us from Brown Brothers Harriman where he has been acting as the global head of currency strategy since October 2005. Previously he was the chief currency strategist for HSBC Bank USA and Mellon Bank. Chandler is frequently called upon by newspapers and news wires to provide insight into the developments of the day, including essays published in the Financial Times, Barron’s, Euromoney, Corporate Finance, and Foreign Affairs. In addition to Chandler’s recent book, Making Sense of the Dollar, his current research projects include global imbalances, Islamic finance and the relationship between savings, investment and growth. You don’t want to miss this highly educational episode! Narrator: Welcome to the American Monetary Associations Podcast where we explore how monetary policy impacts the real lives of real people and the action steps necessary to preserve wealth and enhance one’s lifestyle. Jason Hartman: Welcome to the American Monetary Associations Podcast. This is your host, Jason Hartman, and today we are going to talk about Making Sense of the Dollar. The author is published with Bloomberg Books. And I think you’ll enjoy this show. He’s pretty bullish about the dollar. I happen to be pretty bearish about the dollar. And we’ll see who is right ultimately, but we’ll talk about making sense of the dollar today. And on future shows, we’ve got a lot of great stuff coming up. We’re going to talk about the looting of America. We’re going to have Thomas Sowell on to talk about the housing boom and bust. He’s a senior fellow with the Hoover institution as you may know and a great author. And we’re going to talk about the dangerous reality of our fraudulent monetary system, America’s Crime of the Century with Director James West, all kinds of great shows coming up. But today let’s talk about Making Sense of the Dollar. Jason Hartman: Our guest today joins us from New York City. And it is Marc Chandler. His book caught my ear as I was listening to Bloomberg because he seems to be one of the few voices out there who is actually impressed or shall I say a little bit bullish on the dollar. He’s authored a new book called Making Sense of the Dollar: Exposing Dangerous Myths about Trade and Foreign Exchange. And the question we really need to think about as we’re talking with Marc today is is the dollar losing its luster as a world currency? Has the credit crisis forever tainted the US dollar? Will the euro and yuan replace the dollar as the world’s reserve currency? Chandler argues convincingly that many people are wrongly pessimistic about both the dollar and the US economy and that The United States remains a vibrant and innovative country despite the severe credit crisis. Marc, welcome to the show. Marc Chandler: Thank you – it’s an honor. Jason Hartman: It’s great to have you on. Well, tell us a little bit about your background real quickly if you would and what spurred the book and why we should not be concerned about the value of the dollar and the countries, the economic state as well? Jason Hartman: You’re a Sammy Sosa fan? Marc Chandler: Sammy Sosa fan, yes. What happens I think is my background, I have a Bachelors is American History. And I studied not traditional American history, but what many people would regard as revisionist school of American history. And they have a more critical understanding of US foreign policy, US economic policy. And yet using those analytic tools, I should say I went on to get a masters in international relations as well, and using those tools from American history, I applied them to try to understand is America in decline? I think in many ways, that has been one of the key issues that come out of this crisis. But also even before the crisis. Is America our way of life? The American commercial empire, is it on the way down? And I use these analytic tools since left of center analytic tools and I come up with what seems to be a kind of conservative conclusion. And that is that the viability of the US empire remains probably our best days may still lie ahead of us rather than looking back as sort of we peaked. I think that we have to think about power. And that’s what my degree in American history helped me do and of course focusing on the markets and International Relations that’s been put into a context. If I would be able to say one story that sort of captures this, it’s a story about 2 boys being chased by a tiger. And one of the boys stops and puts on a pair of gym shoes. And his friends says to him you’re not gonna be able to outrun a tiger by just putting on gym shoes. And his friend says I don’t have to outrun the tiger, I have to outrun you. Marc Chandler: And that, as the US economy may seem as troubled as we are with huge debt to the government, monetization of that debt by the Federal Reserve, households overstretched, we’ve engaged in two wars that aren’t popular, despite all these things I suggest to you that the source of strength, dimensions of power that the US still has, it’s still not rivaled by anybody. Jason Hartman: Well, I would agree with you and I’ve heard that story told and I’ve told it myself with a bear rather than a lion. It’s a great metaphor. And The US is by far the world’s largest economy, by far the world’s most powerful military. As the Stratfor founder we were talking about before we started recording has suggested America controls every sea and ocean on Earth basically. Its reach is immense – there’s no question about it. Marc Chandler: Not just those kind of things, but people say to me America’s lost its innovative edge. Last year, one US company got more patents than all of China. Jason Hartman: Who is that by the way? Marc Chandler: Full disclosure, I do not have investment of this company, it’s IBM. Jason Hartman: IBM, really, okay. Marc Chandler: What about other things of the future? Not just military. It turns out the US spends roughly twice the amount of money as say China does, percent of GDP on research and development. There’s only like 3 or 4 countries that spend more money on research and development than The United States. And they tend to be small countries, Finland, Israel, Sweden, and Iceland. And then we think about higher education. What’s our future gonna be on? Our future’s not gonna be on like flipping hamburgers. Where’s our future? Higher education. The US spends more money on higher education than almost every other country. And even though we have problems in the primary and secondary schools, it would seem to be largely a function of the disparity of wealth in The United States. But our higher education is the best in the world. Out of all the students that go overseas, outside the country to get a college degree, 30% of them come to the United States. This is the future. Jason Hartman: No question, we have the best universities and we have a lot going for us. And one of the things that’s a more amorphous thing that you didn’t mention that I’d like to mention is we have the American brand and we have the brand of America, just its perception around the world. And it may be negative in like the foreign policy circles, some people say it’s imperialistic and so forth. But I’m talking about the lifestyle that most of the world really dreams of is really the American lifestyle to a large extent. Marc Chandler: For me partly it’s a strong suit of ours, I agree, the American brand. A guy who writes the Atlantic Monthly, James Fallows, and he was stationed in Japan for many years, as he was leaving Japan, bringing his family to The United States, he asked his young son what’s he gonna miss most about Japan? And the boy said McDonalds. And I think it tells you a lot about the American brand. If you think about Sony in The United States, Sony is a Japanese company. They get a larger share of the profits in The United States than some US companies do. Jason Hartman: Sure, yeah. No question about it. So, all of that is true and I’ll give that to you and I agree with you. But let’s talk more specifically if we can about the dollar itself. I mean, the government is printing money at historic rates that have never been even approached before in the history of the country. It seems to be like the Zimbabwe model almost. The debt is enormous. I mean, we’ve exceeded that 10 trillion dollar number. The entitlements and the obligations of the federal government add up to about $60 trillion over the coming years. This is larger than the economy of the globe by many estimates. How will we pay for all this? I mean, where will the resources come from to not have the dollar debased by printing more of it? Marc Chandler: Sure. Very important question. I think it’s like the $2 million question as it were. I think partly, when your listeners buy a stock or a bond, they know what they’re buying. They’re buying a claim on a future earning stream that can be modeled. Currencies a pure form do not have this earning stream that can be modeled. At the same time, you decide to sell a stock, you can get the money in cash, you can buy gold, you can buy wheat, you can buy Chinese stocks. The problem is when you sell a currency, you gotta buy another currency. So currencies is so stuck in a foreign exchange universe. So when you sell a dollar, you gotta buy another currency. And so you say, well, US has a lot of debt. But it turns out that when this crisis began, the US debt to GDP. . .And the reason we look at debt numbers relative to GDP is to compare apples and apples. So we have it in dollars because the US economy is so big. So you say $10 trillion. It sounds like a large amount of money. It’s less than 1 year of production in The United States. So, when you look at these numbers as a percent of GDP, the US debt to GDP began its crisis at about 45%. Japan, and by the way, the Japanese yen today is among its strongest levels early for the year. The Japanese, that’s the GDP ratio, is close to 200%. Europe, and most European countries that we think are very prudent like Germany, France, are well over 50%. Jason Hartman: Circle back if you would what is the US debt to GDP ratio. Marc Chandler: US began this currency about 25% and today we’re at about 70%. Jason Hartman: We’re not at 100% though. Because you said it takes a year, it’s a year of production is the way you put it I believe. Marc Chandler: Yeah, GDP to the US is about 14 ½ trillion dollars. Jason Hartman: And we’re at about $11 trillion now. Marc Chandler: About $11 trillon. And the reason that debt level seems large right now, the US economy is in a recession. And when a recession happens, tax revenues to the government stall because corporations are not making as much money. More people are unemployed, so there’s less withholding tax. And the other side of it, the expenditure side, we spend much more money transferring payments such as unemployment compensation. So during a recession, the budget tends to be larger than otherwise. But of course, this is a very serious recession, something that most of us have not experienced in our lives. I mean the deficit’s probably going to get bigger before we can really begin consolidating and begin reining it in. And in the next 2 years or so, they really start to hit their entitlement age in mass and they’re going to be pulling a lot more money out of that system and with life expectancies increasing now, granted maybe people will work longer which I think is certainly good because that increases production, so that’s good news. But they also demand more health care and so many of these promises by the more and more left-leaning government over the last 4 decades have been made by politicians to buy votes. They’re all expecting something. And the government will probably keep the promise, at least in nominal dollars. But that burden becomes even larger. And I see what you’re saying about the budget becoming larger during a recession to sort of get people over the hump. Absolutely accurate, I agree with you completely. Marc Chandler: I guess I’m thinking the demographics is a relative thing. US demographics are shifting as you suggest, but they’re not nearly as bad as many other countries. Here’s partly why. 1980s and 1990s, US imported, as it were, a million immigrants a year, more than the rest of the world combined, leaving aside the political refugees, just immigrants, people who want to come to your country and work and have a life – a million immigrants a year for 20 years. So what this means then is that, give you an example, is that Japan has a streaking population. Ukraine and Russia are on a verge of a shrinking population. Italy is not that far behind. And The US if you fast forward say to 2030, Europe is going to have roughly twice as many people above 65 as children below 15. Jason Hartman: Wow, the demographics are just shifting so quickly. I mean, the west has stopped having babies pretty much. Marc Chandler: What keeps the US population growing is not so much the native born population, but immigrants. We look at the fertility rates, China, Japan, South Korea and Taiwan, they’re already below the replacement level which are the level of births per women. If we fast forward, the demographic situation is serious here but it’s much worse in other countries. And the other point would be that we still have a relatively low population density. That is we can take a lot more immigrants and our culture is open to it. Even though from time to time there’s a backlash against it. People like Pat Buchanan want to build a big fence around the country and keep it white and Christian, but I think in the big picture of things, immigrants to the US is part of the dynamic of The United States because we have a tradition, unlike Japan, treating a population, but no real willingness to have immigrants. So I think the cultural values, the American brand of a melting pot, is still a strong suit for The US, and because we have generally somewhat younger population than other countries, the demographic issue we’ll be able to work our way through easier, not like it’s gonna be a piece of cake and you’re right, there’s some real problems. I want to make sure my mother still gets social security. I want to make sure I still get social security. I want to make sure that we have health care for Americans. But I think that as problematic as these are, we have a type of economy and country that’s easier. So if I had to bet which country can address the demographic issues easier, my mind would be on The United States. Jason Hartman: Well, I would agree with you until I say let’s pick apart those demographics. So, the influx of immigrants has changed. And please, listeners, don’t give me some rap about being critical or anything like that. I’m just stating the fact of what it is. It’s largely Hispanic populations and it’s largely less educated people some would argue are not assimilating enough. Some are, some aren’t of course, depends. But what do you say to that? I mean, these are not like high income, highly educated people for the most part. Mar Chandler: No, I think that’s part of the beautiful thing about how immigration in The US works. My family came over in the 1880s and they still spoke their old language. My family came from Poland and Lithuania. They would still speak in the old language. And it took a generation, two generations for them to sit in. Remember you could go to many urban centers in The US still and find ethnic neighborhoods. And so I think that this is largely an issue of digestion. A surge of immigrants and now we’re trying to digest it in a time when we’ve got rising unemployment and greater anxiety. Now we’ve got, after the Berlin Wall fell and after China embraced capitalism, you’ve got now a work in The United States not just competes with western Europeans and Canadians and Japanese, but now they gotta compete with 1.1 billion Chinese, another billion Indians, and hundreds and billions of eastern central Europeans. So I think that the anxiety makes us a little more center to the immigrant issue. But I think that that still becomes a source of strength for the US even though it might not feel like it in the short run. In the long run, this is a source of dynamism to The United States. Jason Hartman: And I agree. The US has always been very open. It’s really part of the American business model to accepting immigrants and that does keep the population younger and it keeps it from becoming a Japan or Russia. I mean, Japan is fine just because of shrinking fertility. And then Russia is shrinking fertility but also huge alcohol problems and so forth. The thing I’d like to ask you though, also, about the immigration issue is it seems like the analogy you gave about outrunning the lion by putting on the tennis shoes, you just have to outrun the other person, so if America just outruns the other questions, you’re right, America in relation is doing better. Okay, true. But the problem is that it’s not a closed system as it was when we didn’t have this globalization and very open trade. Now the system’s very open. So it’s sort of like we all need to win. The whole world economy needs to be winning kind of together. It’s not like we can let our other countries get eaten by the lion, you know? We gotta all win. We got all peopled up. Marc Chandler: I think so. I agree with you that because it’s a much more tightly wound world, we’re sort of bound in it together, but I think this is where it comes down to the rule of the dollar and the rule of the US economy. So, a pre-condition, in order to get the dollar to decline, lose its role in the world economy, remember to think about the what the role of the dollar is in the world economy. 2/3 of the world’s reserves are kept in US dollars. That roughly has not changed since 1990. It fluctuates year to year, quarter to quarter. But generally speaking it’s about 65%. The dollar is also. . .You name a commodity, from energy to food to fibers, traded [00:16:35] in US dollars. Something like 50% of Italy’s exports are not invoiced in euros but invoiced in dollars. When Australia sells [00:16:43] China, China’s gotta pay US dollars. So, it’s another rule of the dollar. Think about this. The stink test, the smell test as it were, sometimes I travel for business. I’m in a foreign city, I land at the airport, and sometimes I don’t have enough of the local currency to get me into my hotel or to see my client. So I ask the cab driver can I pay US dollars? I have never been turned down. I do not have the intestinal fortitude to ask the taxi driver if he would take Chinese Renminbi. I would imagine he would laugh me out of the cab. Jason Hartman: Right. Yeah, that’s a good point. I’ve traveled all over the world, too, and the dollar’s pretty welcomed. Marc Chandler: So, in order for the dollar to demise, we need to have an alternative it. Look what’s happened. China, I don’t know if you’ve seen this, there’s a lot of talk going around the markets that maybe China is encouraging some of its data on enterprise to renegotiate contracts. They decided to buy, say corn, 3 months ago. But now the price of corn’s fallen. Say it’s fallen from $3 a bushel to $2 a bushel. Why should the Chinese businessmen pay $3 a bushel when we all know it’s only worth $2? And so contract law, the transparency of the financial system, the transparency of the legal system, remember what happened, China is negotiating with an iron ore company and then arrests the chief negotiating team because they say they’re spying. And so China’s gonna replace us? I don’t see that. What about Europe? People said to me, in 1999, when the euro was born, people said to me now that there’s an alternative to the US dollar, everybody’s gonna just flock to the euro. Today the euro is not much bigger than the sum of its parts. That is before the euro existed, there was a European currency unit. It’s a basket currency called ecu and then the Deutsche market and French franc. Those three together made up about 25% of the world’s reserves. The euro today, roughly 25% of the world’s reserves. To me, the first thing I would need to see that the dollar’s role in the world is going to change. Say okay, maybe it will, what’s gonna be the alternative? And I just don’t see a clear compelling alternative. I think of it like our keyboards, the QWERT. That’s kind of silly, right? Why can’t they just put them in alphabetical order? Come up with a new keyboard. . .You’re right, the first moving banished, so the next mover has to be marginally better in order for me to change, it’s got to be a whole lot better. So, I think that right now in the world, there’s no real alternative to the transparency and depth to the US treasury market. There’s no real compelling alternative to the US dollar. I think that the two conditions for the dollar to really lose its role is a clear alternative and for the US to lose its will. And I think that we might have our difference in opinion about President Obama. I do not think he wants to give up the US empire. I think he wants to help manage it more efficiently, I don’t know, maybe even arguably more responsibly, but he doesn’t want to give it up. The US isn’t abdicating. People might have confused George Bush pat Buchanan, but I don’t think the country has. We’re not about to give up and build a big fence around the country. Nothing comes in, nothing goes out. Jason Hartman: Okay, so let me just address a couple of those things. And I told you I was gonna kind of challenge you a little bit here, okay. So, the reserve currency issue. There’s a lot of noise being made by other countries. Brazil and Russia are trading outside of the dollar. Gisele, the famous supermodel, wants to be paid in euros. No big deal, but it just kind of makes a statement. Marc Chandler: Taj Mahal last year said they won’t accept dollars. And there’s some places here in New York on the east side, different in the west side if anybody watches Seinfeld, but some stores on the east side are willing to take euros. But I want to tell you, we know that our politicians are lying. We know US when politicians are lying, because their lips move. But somehow when a Russian politician or a Chinese politician says something, we take them at face value. The political economists are saying it would be [00:20:21] between declaratory policy and operational policy. Declaratory policy is what people say, operational policy is what they do. And here’s what the Chinese, who really are leading this charge by dumping the dollar, and verbal, their declaratory policy, but operationally, second half of last year, China increased its treasury holdings by more than a third. January, February and March of this year, they were also barred to the US treasury. April, they printed as small mint sellers, but they came back to the buy side in May and June. So I would say this. Central banks talk about it but I would say their content of it is much more about politics than it is about economics. And the bottom line here is that on a big picture view, there’s no real sign of foreign central banks selling the US dollar, selling treasuries, reducing their hold on anything, central banks that accumulated roughly another 3 or 4 hundred billion dollars’ worth of treasuries this year. Jason Hartman: Okay, so the one argument with that would be that they are still buying, but they’re buying less than before. And also, some speculate, and this is on a little bit more of the conspiratorial side, that they’re being sort of forced to buy through behind the scenes political maneuvering and so forth. I don’t know about that, but it’s one. . .
Marc Chandler: It’s true. Partly, why are central banks buying treasuries and why are they building up reserves? Partly they’re recycling the trade surpluses. They take the trade surplus, they say we don’t want to get this to affect the economy. So we’ll take those dollars we get for selling our goods to the hungry Americans, and we’ll take those dollars, we’ll put them in our reserves. Because of this crisis, trade surplus has diminished. And not only has the world’s trade surpluses diminished like North Korea and Brazil’s and Australias, but the US trade deficit is selfish hook. So just at the moment in town where a current account of it is smaller, other countries have smaller trade surpluses, so there’s somewhat less money to circulate. But I would say that this year, what surprised a lot of people, is that despite a huge amount of supply coming into our treasury, despite a huge supply coming in from corporate America who’s issuing bonds, the US Treasury yields, we’re talking about a 3.28% today, so it’s up about 100 basis points this year, partly because at the very end of last year it looked like the Titanic hit the iceberg. The world economy was sinking and sinking fast. And so US interest rates stalled very low. That discouraged people from buying long term bonds. So, instead, the central banks and other people bought short term instruments now that the bond market has risen again, 100 basis points here to date. But still, that 3.2% was still very low. You look at a country like Germany. People think a more prudent country, they’re not monetizing their debt nearly as fast as we are, in smaller deficits. Their 10 year bond yield is 3.22%. They’re the 6 basis point difference between us and Germany, people perceive as one of the more prudent countries. I don’t see the signs that foreigners have stopped buying treasuries. I don’t see a sign yet that the supply has really weakened the dollar. When I look at things, I’d say that the dollar was much stronger than it was a year ago. I can put this in perspective for you. Jason Hartman: But a year ago was a disaster, a year ago this month or next month. So I don’t know. How does it compare to two years ago? Marc Chandler: You can pick starting points. So, I would say it’s not clear to me. If you want to argue that the policies that the last couple of years of the Bush administration are pursuing, what Obama has furthered and extended. . .I mean, Bush gave us our first stimulus package. Obama’s giving us a 2nd one now. Jason Hartman: Maybe a third one’s coming. Marc Chandler: Maybe a third one. I suspect this third one a piecemeal like the cash for clunkers, the minimum wage hike. There’s a third one but they can’t call it a package to get through congress. But I would say that during this time, we have not seen the kind of decline during this period of rapid growth of the budget deficit, rapid monetization of debt, we have not seen a large decline of the dollar. We could see one, it could be in the future. But that is like what don’t we know now that we’ll know then that’s gonna change people’s attitudes? I see the inflationary risk, but I think that in the near term, the bigger risk than inflation is the opposite of inflation which is deflation. I’ll give you an example. We have this thing that both the Federal Reserve and the European Central Bank has cited as a gauge of inflation expectations. They don’t really care where inflations have a very short run because that’s gonna be influenced by the price of oil and commodities. What they want to do is take a look at not inflation say for the next 5 years, 2010 to 2015, they might take a look at inflation expectations, 2015 to 2020. They think that is where the real signal is of inflation expectations. And here’s what it looks like in The United States. It’s called a 5 year forward which is inflation expectations. Right now it’s at 2.26% in The US. In France, which is a proxy for Europe or the Euro Zone because Germany doesn’t have very liquid instruments here, France is 2.84%, roughly 50 basis points on top of us. The UK is at 3.30%, more than 100 basis points more expecting inflation there than at home. So, I just don’t see the inflation so that they peaked up by the market. The market knows Obama’s issuing a lot of debt and Bernanke’s providing the reserves to buy it. Jason Hartman: Right. We gotta do a little bit shorter answers just in the interest of time because I have so many questions for you. First thing I want to say is back to the reserve currency issue. That G20 meeting that was held about 2 months ago, what was going on there? It’s so secretive and so forth. There’s rumors of talk of a new currency. You were saying what else is there that’s gonna be the better QWERTY keyboard, better than a dollar, right? And so can you address that just real briefly, that G20 meeting? Marc Chandler: Yeah. China’s central banker had a page on their website which is freely available, it’s in English, people at the Bank of China. And he proposed that maybe we use these SDRs, Special Drawing Rights as sort of a money type thing created by the IMF. No official that I’ve spoken thinks they’re really a starter. It’s primarily a way that China can tell The US to bugger off. That is every other meaning that there was before this G20 meeting, the US would tell China get your currency to appreciate. China was getting tired of getting picked on, and so China retaliated. And as we go from sports, one of the best forms of defense is to go on offense. That’s what China did. Ahead of the G20 meeting coming up, China’s not saying a word about it and we’re not saying a word about their currency. There’s been like an agreement to disagree and we both has sort of backed off from teasing each other, from sort of trying to egg each other on. Jason Hartman: And China has been accused, by the way, of artificially devaluing its currency to increase its exports. Marc Chandler: Yes, the Chinese currency under Bretton Woods, the fixed exchange rate regime, currencies were allowed to move into 1% band and that was regarded as a fixed exchange rate. Since the beginning of this year, China’s currency’s moved in less than ¾ of a percent rage. It sticks back to the dollar. Jason Hartman: And then your prior thought that you were just giving a moment ago, one of the things that whole argument presupposes, though, is that The US has accurate expectations of inflation with that index that you were talking about. Maybe The US is manipulating more. Certainly, no one would disagree that the CPI is manipulated and so forth to whatever side you want to think it is. But no one says it’s perfectly accurate by any means or the core rate. And then why would the expectation numbers be accurate either? Maybe other countries have more accurate expectation stats and The US has less accurate. Marc Chandler: That’s fascinating. You’ve seen that game show Who Wants to Be a Millionaire? Marc Chandler: It turns out that the audience is right 95% of the time when they’re asked. And so that’s one of the beautiful things about the market. It aggregates all of our individual knowledge. And individuals, we might be silly, stupid, uninformed, but as a group we’re very smart. That’s why the federal reserve and the ECB often cite market driven prices or instruments as reflections of inflation expectation because you get people who are willing to put their money where their mouth are – they vote with their pocketbook in effect. And so these indexes, I mentioned the 5 year forward, is determined by people buying and selling things all day long. That’s why not only the audience is right 95% of the time, but that’s why opinion polls, polls of who’s gonna win for the President in the United States tend to be more accurate than measures of the individual forecasters. So it’s not perfect. There’s a number of different ways to get inflation expectations. Market instruments seem to be where central banks are looking at. Jason Hartman: Okay. So, please explain to the audience, if you would, if there is any difference between the value of the dollar, whether it be moving up or down, and inflation and deflation. Are those separate issues or are they the same thing? Marc Chandler: Inflation, as we economists understand it, will be an increase in the general price level. If you say the price of gasoline goes up is then inflationary I’d say the more money you have to spend on gasoline, the less money you have to take the family out for a restaurant. So what we’re really talking about there is a relative price change. The price of gasoline goes up, other prices fall because of lack of demand or stay the same. Inflation, increase of general prices, deflation in general is fallen prices. So what happens then is what causes inflation? Some people think, Milton Friedman, that inflation is a monetary phenomenon, that the central bank prints off more money than goods are being created, more money chasing few goods. So how does the dollar fit in here? Often times when the dollar falls, the argument goes the dollar declines and the price of imports, America is really hooked on imports, if the dollar falls, the imports that we buy the price goes up. So say the dollar falls against the Japanese yen and now the price of maybe our stereo system goes up. And then that allows domestic producers to raise their price and now you’ve got a general price increase. So an interesting thing about why it typically does not happen like that in The United States. A good comes to The United States, say to the New Jersey port or a California port, the price of that import then, that good that comes in, now has to be stored, it has to be marketed, and it has to be distributed. Those cost. Storage, marketing, distribution, adds on 30%-50% of the price of the good. And those prices, the storage, the marketing, the distribution, are dollar denominated. So, typically, we call it past due. That is how much of the currency shock, currency adjustment, is past due to the consumer. It’s interesting because countries, capitalism is not monolithic. Companies say in Europe and Japan for example, they rely much more on bank capital. The bank capital is patient. So when they compete, they’re more likely to eat the currency shift and try to preserve market share because that’s a long term way of staying in the business. American business, British businesses, and we’re hit with an exchange rate shock. We have access, not so much in patient capital but the inpatient capital of the market. So companies in The US and The UK will get hit with an exchange rate shock that they have to pass onto the customer. They compete by preserving profit margin. European and Japanese companies compete by preserving market share. Two different ways of competing, and their way, that is European and Japanese way of competing, helps prevent a weak dollar from fueling inflation. Jason Hartman: Okay, so what you’re really saying there is that the value of the widget coming into the port is only a small. . .well, it’s not a small portion, but it’s certainly not everything in terms of what happens because what happens after it gets here is all dollar denominated. And that really determines a lot about prices and inflation or deflation, is that correct? Marc Chandler: Yep. And the other point I’d make is that almost 95% of what The US imports is already invoiced in dollars. People don’t charge us Chinese renminbi when we buy Chinese imports. We don’t pay Brazillian real, we pay dollars. And these prices, when businesses make prices, they usually are locked in for a period of time, 6 months, 12 months. The currency market is volatile, it moves around quite a bit. But the prices of our goods don’t adjust as quickly as the price of money. Jason Hartman: Certainly, I agree with that. Now, it’s certainly interesting to note, and I’m sure you’ve studied the Zimbabwe disaster, I remember reading just several months ago that they were arresting shopkeepers. What happened is prices were rising so fast due to their printing press, they told the shopkeepers that they could not raise prices. If they did raise prices, they would be arrested. And so shopkeepers decided, hey, look, if I can’t raise my prices, the currency’s devaluing so quickly, if I can’t raise my prices, I can’t stay in business so they just stopped selling goods and then it led to shortages. So, it’s interesting, when you talk about Milton Friedman, how he and the Chicago school believe, inflation everywhere and it always is a monetary phenomenon, Harry Dent and Marc Chandler, yourself, would differ with that, I’m having a hard time getting my head around that it’s not a monetary phenomenon. I know there are other factors, but it just seems if you have more dollars chasing a limited supply of goods and services, you’re gonna see price increases all the time. It takes time, doesn’t work its way through the system instantly. I’ve heard everything you say but I gotta let this sit with me for a while. Marc Chandler: I think a lot people are concerned. I think about Warren Buffet’s piece in New York Times a few weeks ago. I think he called it Greenback emissions. And his argument wasn’t so much about current inflation but the prospect of future inflation. I think that’s what scares most of the institutional money managers I know, many of the high net worth individuals I know. They’re concerned about inflation not today, not tomorrow, maybe even not next year. So, I think they’re very sympathetic to your point. And from my point of view, I’d say that it’s a possibility rather than a certainty and I think that it becomes. . .I might say that the book has not been written yet. That is our state is in our own hands. What’s happened is the Federal Reserve has printed, in effect, a lot of money. But that money, a bulk of it has stayed at the Federal Reserve. Basically what happens is the Federal Reserve buys a bond from the market. Rather than just printing off money, they credit their banks in the reserve account. And the banks leave that money with their account at the Federal Reserve, the bulk of the money, hundreds and billions of dollars now. And so the issue is will this money, which is where people think the fuel’s gonna come for inflation, will this money leak out of the Federal Reserve and chase goods or financial assets? And right now the problem is we can’t get the banks to loan the money. Jason Hartman: You’re right about that but that’s the whole point of the Obama spending. Obama’s pitch is, look, I’m going to spend money. And granted he’s gonna do it on cash for clunkers, infrastructure, energy efficiency, all of the big goals I hope work out. But money will be put into the economy under an Obama administration. It will be in people’s hands. Marc Chandler: Yes, it’s true. But that money is making up for the loss elsewhere. It’s not like new money coming into the system. A lot of money’s been destroyed by house prices, by decline in equity markets. Even though the stock market’s up this year, we’re having a good year, yes, but it’s still well off their ties. It’s an effect, what happened is we dug a deep hole. The Federal Reserve comes along and puts some dirt in that whole but it’s still not level. Jason Hartman: Right. It’s only half refilled or ¾ refilled, I agree with you. Marc Chandler: Yeah. So, is that inflationary? Yes. So, could it be that the dollar is really becoming inflationary? And it might be. And I think this is probably the battle that Niall Ferguson has with Paul Krugman. Paul Krugman says it’s not necessarily going to be inflationary. And I think Niall Ferguson takes your point of view. And I think, in some ways, the debate is between the monetarists and the Keynesians. In some ways, when it comes to natural sciences, we progress. We know we have atomic theory in our [00:35:14]. We know how many planets there are in the solar system, we know our light works. Problem is, in the social sciences, you don’t seem to get very far. Many of the debates that we’re having now are just rehashing the debates that took place in early part of the 20th century with Keynes and some of his critics. And we haven’t really progressed very far. But I do think that, when push comes to shove, that both problem are right and it could be inflationary, but it doesn’t have to be. That is policy, we, individuals, what we do matters. Jason Hartman: Okay, so I agree with you there. Just a simple answer because I want to make sure the listeners really caught what you said there. It was rather convoluted and I know you have to back it up with a lot of things. Does the devaluation of the dollar mean inflation or is it separate? Marc Chandler: You can have a devaluation of the dollar and not be inflationary like we’ve had right now. You’re going to have a weak currency and have low inflation. You’re gonna have a strong currency and have low inflation. Telling me a currency, guessing inflation is like telling me you have blue eyes, guess how tall you are. Jason Hartman: And would you classify yourself as a Keynesian? Marc Chandler: I don’t know. I think understanding economics is so difficult. I think of myself much more as eclectic and pragmatic. I see what works and I do that. Jason Hartman: In kind of rapping this up and bringing it all home, what does the future of our economy look like over the next year, the next 2 years, the next 3 years? I mean, is this recession gonna get worse? What can we expect? Marc Chandler: I would say in a short run this quarter that we’re currently in, the 3rd quarter that’s winding down, 4th quarter and probably the first 2 quarters of next year seem to me to be probably fairly good. If anything, the market is probably underestimating the growth here in the 2nd half of this year. However what we I think as Americans have to get used to is we probably are not gonna go back to sustained on a trend basis, 3% plus growth. We probably have to lower our expectations. I think for me one of the big problems is that it’s possible, perhaps even likely, that our children and our grandchildren don’t live as good as we do. I’ll give you an example. The World Health Organization says all we need is about 25 gallons of water a day per person. And the average North American that’s US and Canada goes through about 150 gallons of water a day. That does not seem to be sustainable, especially as more of the world modernizes. So, I do think there’s some problems. But I think that in the future, what we should do is look for more growth short term, low inflation short run, longer term slower growth, and inflation is not gonna stay at these kind of low levels, but core inflation probably stays between 1 and 2 percent. Jason Hartman: Okay, so 1 and 2 percent core inflation which means the CPI is gonna read, what, about 4%? Marc Chandler: CPI could go up, headline CPI importantly because headline CPI picks up a lot of oil and oil prices, as you know, well off the highs from last July. So we look at you every year and as we get further into the year, we’re going to get a big rise in headline inflation just because oil prices are no longer at $160 a barrel. Jason Hartman: And just for the listeners I want to distinguish, of course we’ve reviewed this on the show before, but core inflation means the CPI excluding food and energy because it’s theoretically too volatile, although I don’t know anybody who can live without food and energy. So. . .
Marc Chandler: I think you’re right, sort of like a radio. The radio, sometimes when you listen to a music station, it produces music and it sometimes produces noise. And sometimes people can differ. I think my parents did not think Elvis Pressley was music. Now we know better. So easily we can differ on what’s the music and what’s the noise. And the Federal Reserve argues that core inflation is a signal just to music, other stuff is noise. And what we want to do is keep an eye on the signal, not just the whole thing but that it is the truer signal of where price pressures are coming. Jason Hartman: Yeah, right, fair enough. I just know when I go to the grocery store or the gas station next time, I’m gonna tell them I want to pay the core rate. I’m being sarcastic there. Okay, so that’s kind of your forecast for the economy. And Marc, just kind of wrapping this up, any thoughts for the listeners? And where can they buy the book? Marc Chandler: Sure. The book came out the middle of August. And I should say something about the book. It looks at 10 different myths about the foreign exchange and trade and I think it complicates the situation. And these are like well-rounded myths that people have believed for a long time. I think it’s a bit thinking outside the box. A lot of people are concerned about economists and all these mathematic formulas and charts and equations, and there’s nothing like that in the book. There’s some pictures and charts, but it’s not mathematical equations. It’s a narrative. I explain things in a non-jargon way. The book is available. Bloomberg published the book. The book is available at Bloomberg, it’s available at Amazon. I would like it if people do read the book. And even if they don’t necessarily like it, Bloomberg tells me that having reviews on Amazon it helps even if people don’t agree with the book. What I expect people to do, as long as they think it’s a thoughtful provocative book, I think I’ve done my job. I also have a blog that people can follow my analysis. It’s called Marc to Market, marctomarket.com. Jason Hartman: Okay, so that’s a play on your name, Marc to Market, that’s excellent. Okay, good. Well, Marc Chandler, thank you so much for joining us. 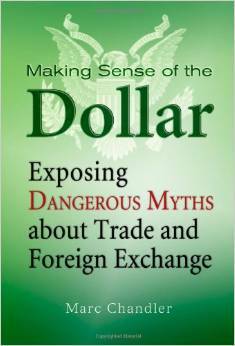 The book is Making Sense of the Dollar: Exposing the Dangerous Myths about Trade and Foreign Exchange. We appreciate your insights today. Marc Chandler: Thank you very much. Narrator: The American Monetary Association is a non-profit venture funded by the Jason Hartman Foundation which is dedicated to educating people about the practical effects of monetary policy and government actions on inflation, deflation and personal freedom. Our goal is to help people prosper in the midst of uncertain economic times. This show is produced by The Jason Hartman Foundation, all rights reserved. For publication rights and media interviews, please visit www.HartmanMedia.com or email [email protected] Nothing on this show should be considered specific personal or professional advice. Please consult an appropriate professional if you require individualized advice. Opinions of guests are their own and the host is acting on behalf of The Jason Hartman Foundation exclusively.